The acting in this was not as good as it should have been. It was either overacted or underacted. This was a film that should have been a grand epic, but the acting cost it dearly. Again, we have an aspect that cost the film greatly. For a film set circa 1300 BCE, the dialogue was far too modern and lacked prestige. This is a film set in ancient Egypt, and yet both of the leading characters were portrayed by a white person. I can somewhat understand Ridley Scott’s “dilemma” of the studio not wanting to back a film of such (alleged) grandeur with a cast of unknown ethnic actors. However, I believe that there are plenty of ethnic actors who could easily have portrayed Moses and Ramses, and done it more expertly than either Bale or Edgerton were capable of doing. What’s worse, is that the only ethnic actors were all extras playing slaves. Additionally, Sigourney Weaver was completely out of place in her wig and kalasiri. Indeed, she rather looked like a woman dressed as Cleopatra for a Halloween party. Don’t get me wrong, I love Sigourney Weaver, but I think that someone like the Oscar-nominated Iranian actress Shohreh Aghdashloo would have been better suited for the role of Tuya. Surely, Ridley Scott cannot use the excuse of money to defend his choice in casting a white actress as a opposed to an Arabic or black one? I mean, Sigourney Weaver had only 6 lines in the entire film, making her the second-most prominent female character in the film. P.S. This film does not pass the Bechdel test. There are only 5 females with speaking roles in this movie, and none of them ever exchange more than a few acerbic quips to each other. Here’s what this movie was made for. It is clear that Ridley Scott wasn’t concerned about the characters or story of the film. His primary concern was to make this as visually stunning and overwhelming as possible. Watching the crocodiles devour the fishermen and then turn on each other to make bloody the waters of the Nile was quite a beautiful, albeit disgusting, spectacle. And the sweeping aerials of Memphis were quite alluring and magnificent. 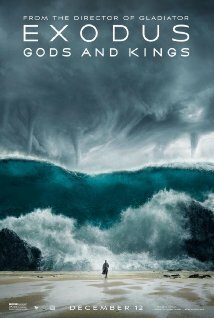 Watching the pristine blue waters of the Red Sea crash down in a tidal wave upon Moses and Ramses was brilliant. But the effects were of such a high quality that it was obvious that it was not real. I just absolutely loved the saturation that is often used in this type of film. I really have no idea how to describe it. There were a couple of points, however, where the film seemed choppy, reminiscent of the early days of slow-motion, but that may have been the projector at the theatre. I just watched this film 16 hours ago, and I cannot remember the music to save my life. Film scores are usually something that stick with me. I either love it, or absolutely despise it, but I remember it. For me not to remember this one must say a lot about the scoring. The sound editing itself seemed perfectly fine. There was nothing that jumped out at me that was a glaring mistake. The story was compelling, 60 years ago when it was released as The Ten Commandments. Unless you know the biblical story, it was hard to tell just how much time had elapsed. This wouldn’t have been an issue, but they told us once exactly how much time had past. So that’s inconsistent. If you’re going to tell your audience how much time has past from the last scene into the next, you need to do it every time, not just once and then expect everyone to know when it happens again. Or don’t do it at all. Also, I found myself just wanting them to get to the point. And yet, a lot of the scenes still felt rushed. I got the feeling that Ridley Scott desperately wanted this to be the pinnacle of his distinguished career. It seemed like he thrust everything he could into this film into making it a spectacular epic to be lauded for decades to come. A film to commemorate his life’s work. Unfortunately, he lost sight of what true artistry is and came up flat, in this critic’s humble opinion.